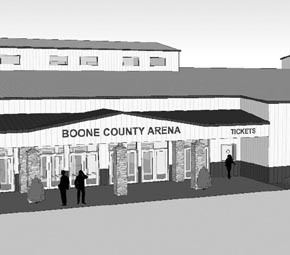 Possibilities for a new fairgrounds livestock exhibit building will be introduced to Boone County and surrounding area residents during a public meeting next Tuesday, June 11, at 7:30 p.m. in the Boone County Event Center. Several factors initiated the new building discussion/design. These included age and structural integrity of the existing livestock buildings, safety concerns with the current show ring size, public access and safety within and around the existing facilities, and weather variability when scheduling events. A planning committee for a possible new facility was formed several months ago. 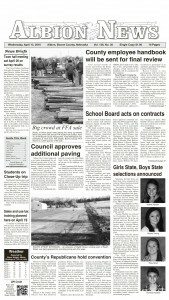 It includes members of the Boone County Agricultural Society, Extension Board and 4-H Council. The committee contracted with Bruce Bailey of Design Associates, Lincoln, to develop an initial floor plan and drawings. Complete story in the June 5 Albion News & Petersburg Press Print and Electronic Editions.